When you place that Welcome mat across your doorstep, be careful who you are actually inviting inside your house. They are named Cold callers a.k.a. Bogus callers a.k.a. Rogue traders, although they come under the guise of workers from the council, police, healthcare, market research, utility or phone companies. Their claims to “check something” can be rather persuasive, especially to the intentionally targeted victims: the elderly and vulnerable. Unfortunately these cunning criminals are not really going to clean the window, repair your driveway and roofing. Once they have convinced the victim and successfully crossed the threshold, they are most certainly not going to offer any home improvement services- as that is not what burglars actually do. • Install the necessary security barriers to hinder outsiders: A door chain and bull’s eye can be useful in these cases; for enhanced security protection door gates or sliding grilles can be the solution you are looking for. • Keep your front and back doors locked even if you are momentarily away. • Avoid doing business with cold callers. • Ask your friends and neighbours recommendations of reputable and trustworthy workmen. • Get at least three quotes- in writing- from separate workmen before you go ahead. • Do not believe everything the callers tell you. • Be wary of youngsters or even children who pretend to have lost their toy in your yard, or people asking for a drink, time or their lost pets-they may be distracting you to gain entry to your house or working with a more skilled burglar. • Never give your details to strangers. • Do not accept any trader’s offer to accompany you or drive you to the bank. • Never pay in full in advance for the work promised by cold callers. • Always ask for identification. 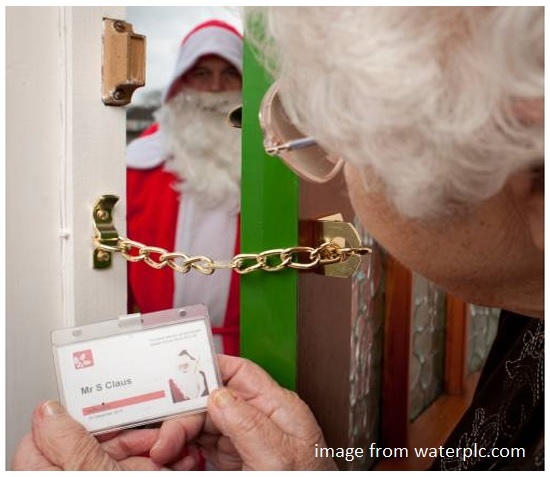 • Use the Bogus Caller Initiative Poster, “I do not recognise you, please go to [name] who is my nominated neighbour. They will check your Identity and return with you,” which is applied in Wales, along with Zone of Cold Callers to deter these criminals. • Genuine officials will wait for you to check their identity, wait outside the door without seeming intent on accessing your house. • Set a system with the utility companies, such that each official who comes must use a password to confirm the caller is genuine. • Lock the back door before you answer the front one-burglars who work in team take advantage of this situation. • Never leave the door unattended; if you need to go look for your reading glasses or any document, make sure you close the door fully before doing so. • Telephone the utility company to ensure the caller is indeed an employee.